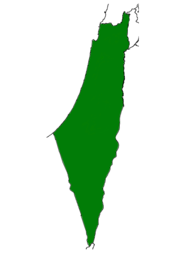 The Palestinian National Covenant or Palestinian National Charter (Arabic: الميثاق الوطني الفلسطيني‎‎; transliterated: al-Mithaq al-Watani al-Filastini) is the covenant or charter of the Palestine Liberation Organization (PLO). The Covenant is an ideological paper, written in the early days of the PLO. The first version was adopted on 28 May 1964. In 1968 it was replaced by a comprehensively revised version. In April 1996, a large number of articles, which were inconsistent with the Oslo Accords, were wholly or partially nullified. The Palestinian National Charter was adopted on 28 May 1964, establishing the Palestine Liberation Organization, in (east) Jerusalem along with another document, variously known as the Basic Constitution, Basic Law or Fundamental Law of the PLO, based on an earlier Draft Constitution. The Charter is concerned mainly with the aims of the Palestine Liberation Organization, while the Fundamental Law is more concerned with the structure and procedures of the organization. The Charter was extensively amended, with seven new articles, in 1968 in the wake of the Six Day War and given its current name. Compared to its predecessor, it focused more on the independent national identity and vanguard role of the Palestinian people, led by the PLO, in their "liberation of their homeland" by armed struggle. Article 7 of the earlier document was changed from "Jews of Palestinian origin are considered Palestinians ..." to being restricted only to those "who had resided in Palestine until the beginning of the Zionist invasion." The final article providing that it can only be amended by a vote of a two-thirds majority of the Palestinian National Council (PNC) at a special session convened for that purpose was left unchanged. The Fundamental Law was also amended, making it more democratic, electing the entire Executive Committee by the PNC, instead of just the Chairman, separating the post of the Speaker of the PNC from the Chairman of the Executive Committee and affirmed the authority of the Executive Committee over the army. Later, (Hirst, 2003, p. 427) a promised Charter amendment based on Fatah doctrine "that all Jews [without date restriction]...were to be entitled to Palestinian citizenship" failed due to doctrinal quarrels over the meaning of the precise nature of the proposed Democratic State. "Palestine, with its boundaries at the time of the British Mandate"
Israel has always strongly objected to the Charter, which describes the establishment of the state of Israel as "entirely illegal" (Art. 19), considers Palestine, with its original Mandate borders, as the indivisible homeland of the Arab Palestinian people (1-2), urges the elimination of Zionism in Palestine and worldwide (Art. 15), and strongly urges the "liberation" of Palestine throughout by ethnic cleansing of Jewish presence. On 14 December 1988, following an outcry from his 13 December General Assembly speech, Yasser Arafat called a press conference in Geneva to clarify his earlier statement by specifically mentioning the right of all parties concerned in the Middle East conflict to exist in peace and security, including the State of Palestine, Israel, and their neighbours. He also renounced terrorism. A. The Palestinian National Charter is hereby amended by canceling the articles that are contrary to the letters exchanged between the P.L.O. and the Government of Israel 9–10 September 1993. B. Assigns its legal committee with the task of redrafting the Palestinian National Charter in order to present it to the first session of the Palestinian Central Council." At one time the text of the Charter at the official website of the Palestinian National Authority appended these amendments to the text of the 1968 charter; the redrafting process referred to in the second amendment still remains uncompleted. First: Amend the articles in the National charter that contradict with the letters exchanged between the PLO and the government of Israel on Sept. 9-10, 1993. Second: The PNC authorizes the Legal Committee to draft a new charter to be presented at the first meeting to be held by the Central Council." This earlier version had appeared on the Palestine Minister of Information's website. Many commentators noted that the text only indicated a decision to amend the charter, not an actual amendment. Official Palestinian websites have since replaced the vague translation with the concrete version quoted above. Yitzhak Rabin said in a speech to the Knesset on 5 October 1995, at the time of the ratification of the Oslo II Interim Agreement: "The Palestinian Authority has not up until now honoured its commitment to change the Palestinian Covenant ... I view these changes as a supreme test of the Palestinian Authority's willingness and ability, and the changes required will be an important and serious touchstone vis-à-vis the continued implementation of the agreement as a whole". Yasser Arafat wrote letters to President Clinton and Prime Minister Blair in January 1998 explicitly listing the articles of the Charter referred to in the PNC's 1996 vote. While this was seen as progress in some quarters, other Palestinian officials contended that the Charter had not yet been amended, and there were also reportedly discrepancies between the two letters. The Palestine National Council's resolution, in accordance with Article 33 of the Covenant, is a comprehensive amendment of the Covenant. All of the provisions of the Covenant which are inconsistent with the P.L.O. commitment to recognize and live in peace side by side with Israel are no longer in effect. As a result, Articles 6–10, 15, 19–23, and 30 have been nullified, and the parts in Articles 1–5, 11–14, 16–18, 25–27 and 29 that are inconsistent with the above mentioned commitments have also been nullified. The articles identified by Arafat as nullified call for Palestinian unity in armed struggle, deny the legitimacy of the establishment of Israel, deny the existence of a Jewish people with a historical or religious connection to Palestine, and label Zionism a racist, imperialist, fanatic, fascist, aggressive, colonialist political movement that must be eliminated from the Middle East for the sake of world peace. The Executive Committee of the Palestine Liberation Organization and the Palestinian Central Council will reaffirm the letter of 22 January 1998 from PLO Chairman Yasir Arafat to President Clinton concerning the nullification of the Palestinian National Charter provisions that are inconsistent with the letters exchanged between the PLO and the Government of Israel on 9–10 September 1993. PLO Chairman Arafat, the Speaker of the Palestine National Council, and the Speaker of the Palestinian Council will invite the members of the PNC, as well as the members of the Central Council, the Council, and the Palestinian Heads of Ministries to a meeting to be addressed by President Clinton to reaffirm their support for the peace process and the aforementioned decisions of the Executive Committee and the Central Council. I thank you for your rejection—fully, finally and forever—of the passages in the Palestinian Charter calling for the destruction of Israel. For they were the ideological underpinnings of a struggle renounced at Oslo. By revoking them once and for all, you have sent, I say again, a powerful message not to the government, but to the people of Israel. You will touch people on the street there. You will reach their hearts there. Like President Clinton, Israel and the Likud party now formally agreed that the objectionable clauses of the charter had been abrogated, in official statements and statements by Prime Minister Netanyahu, Foreign Minister Sharon, Defense Minister Mordechai and Trade and Industry Minister Sharansky. With official Israeli objections to the Charter disappearing henceforward from lists of Palestinian violations of agreements, the international legal controversy ended. Despite President Clinton's optimism, the events of 1998 did not entirely resolve the controversy of the Charter. A June 1999 report by the Palestinian Authority's Ministry of Information on the status of the Charter made no mention of the 1998 events and leading Palestinians continue to state that the Charter has not yet been amended. In 2001 the first draft of a constitution authorized by the PLO's Central Committee, calling for a respect for borders, human and civil rights as defined under international law appeared. In March 2005 representatives of 13 Palestinian factions, including Fatah, Hamas, Islamic Jihad, PFLP and DFLP, adopted a 6 paragraph declaration known as the "Cairo Declaration". The declaration envisions a reform of the PLO to include all the Palestinian powers and factions. In order to implement these reforms it was decided to form a committee made up of the PNC Chairman, the members of the Executive Committee, the secretaries general of all Palestinian factions and independent national personalities. The PLO-EC Chairman is tasked to convene this committee. In the subsequent years, the agreement was several times reconfirmed, but as of 2015 there have not been taken concrete steps. It has been decided upon: 1. Changing the Palestine National Charter by canceling the articles that are contrary to the letters exchanged between the PLO and the Government of Israel, on 9 and 10 September 1993. 2. The PNC will appoint a legal committee with the task of redrafting the National Charter. The Charter will be presented to the first meeting of the Central Council. Formally, the resolution adopted by the council consisted of two simple clauses. The first declared that the council "decides to amend the Palestinian National Covenant by canceling clauses which contradict the letters exchanged between the P.L.O. and the Israeli Government." The second ordered a new charter to be drafted within six months. The decision fails to meet the obligations laid out in the Oslo accords in two respects. First, the actual amendment of the Covenant has been left for a future date. As of now, the old Covenant, in its original form, remains the governing document of the PLO, and will continue in this status until the amendments are actually approved... There is a sharp difference between calling for something to change and actually implementing the changes. Second, the decision does not specify which clauses will be amended. The text of the Palestinian National Covenant remains as it was and no changes whatsoever were made to it. This has caused it to be frozen, not annulled. The drafting of the new National Covenant will take into account the extent of Israeli fulfillment of its previous and coming obligations... evil and corrupt acts are expected from the Israeli side... The fact that the PNC did not hold a special session to make changes and amendments in the text of the National Covenant at this stage... was done to defend the new Covenant from being influenced by the current Israeli dictatorship. In a surprise development, the PLO's Executive Committee decided to take no action on amending articles in its charter... Palestinian Information Minister Yasser Abd Rabbo gave no reason why the committee failed to act on the charter. The PLO Executive Committee, meeting in Ramallah, took no action on amending articles in the Palestinian charter which Israel views as seeking its destruction. The PA Information Minister Yasser Abed Rabbo told reporters the committee had only “reviewed” a letter PA President Arafat had given to President Clinton, listing the charter clauses annulled by the PNC. PLO spokesman Marwan Kanafani was videotaped telling reporters, "This is not an amendment. This is a license to start a new charter." In 2009, Fatah officials, among them Azzam al-Ahmad and Nabil Shaath, confirmed that the Charter would remain unchanged. ↑ The Middle East 1916-2001 : A Documentary Record, The Avalon Project, Yale Law School. ↑ Arafat Clarifies Statement to Satisfy U.S. Conditions for Dialogue (December 14, 1988), Jewish Virtual Library. ↑ Israel-PLO Recognition - Exchange of Letters between PM Rabin and Chairman Arafat - Sept 9- 1993, israel ministry of Foreign Affairs. ↑ The Palestinian Charter, Palestinian American Council. ↑ Letter dated 27 July 1998 from the Permanent Representative of Israel to the United Nations addressed to the Secretary-General, United Nations General Assembly. ↑ Wye River Memorandum: Status of Implementation (February 1, 1999), Israel Ministry of Foreign Affairs. ↑ Israeli Reactions to the PNC Vote in Gaza (December 14, 1998), Israel Ministry of Foreign Affairs. ↑ Palestinian Authority has yet to honor all of its Wye commitments (December 15, 1998), Likoed Nederland. ↑ Press Conf PM Netanyahu and FM Sharon - Erez (15 December 1998), Israel Ministry of Foreign Affairs. ↑ Major Palestinian Violations of Agreements- October 2000 (11 October 2000), Israel Ministry of Foreign Affairs. ↑ The DRAFT Of the Palestinian Constitution (2001), pcpsr.org. ↑ "Peace Watch: PLO Charter Wasn't Changed". iris.org.il. ↑ Internal PLO Document:Covenant Frozen, Not Annulled (26 May 1996), IRIS archives. ↑ Appendix II : Discussion of the Interim Agreement (IA) in Making Oslo Work, by Max Singer and Michael Eichenwald. ↑ PLO did not remove denial of Israel from charter , palwatch.org. ↑ Delegates gather for Fatah congress. 04 Aug 2009. Al-Jazeera. Cobban, Helena (1984). The Palestinian Liberation Organization: People, Power and Politics. Cambridge University Press. ISBN 0-521-27216-5. Hirst, David (2003). The Gun and the Olive Branch: The Roots of Violence in the Middle East. Nation Books. ISBN 1-56025-483-1.